David was the youngest of the eight sons of Jesse. Nothing is said in Scripture about David’s mother, but we know that the family came from Bethlehem, which means “the house of bread”. 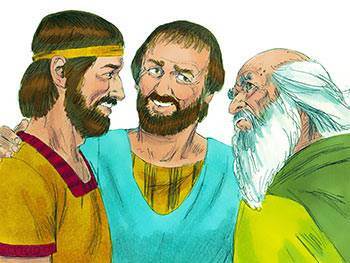 At the time David appears on the pages of Scripture, Saul and Samuel are estranged (15:34). 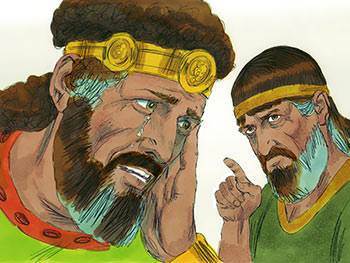 Samuel is instructed by God to anoint one of the sons of Jesse as the second king of Israel—a command which, because of possible reaction from Saul, causes Samuel to fear for his life. 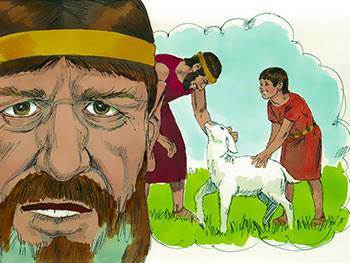 Samuel obeys, however, and invited Jesse and his sons to a sacrificial feast. Seven of the sons are examined by Samuel, but there is no divine confirmation until David is hastily called in from the fields, whereupon the Lord speaks to Samuel and says, “Rise and anoint him; he is the one” (v. 12, NIV). How unlike human ways are the ways of the Lord. The Almighty overlooks the seven stalwart sons of Jesse, and alights on a mere stripling. We can tell how men look, but only God can tell how men are. Keep this in mind the next time you are puzzled about the way God goes about His choices. 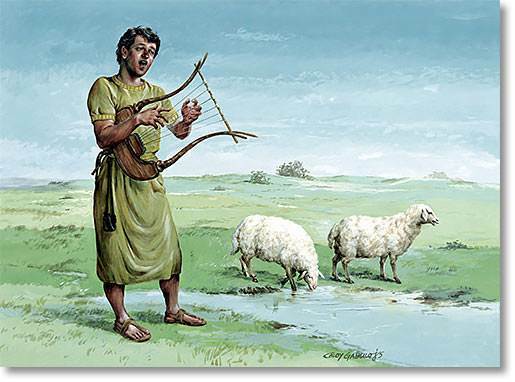 After Samuel anoints David as the second king of Israel, the young lad returns to his task of looking after his father’s sheep, where he develops some skill as a musician. 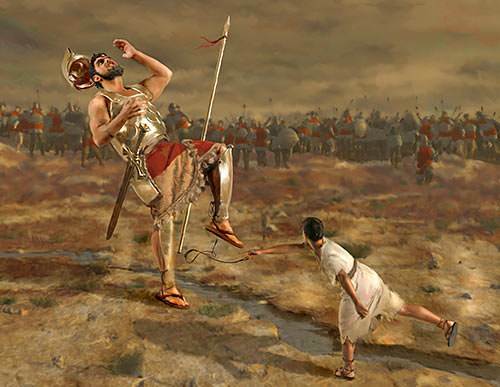 It appears that he has fighting skills too, for he is described as “a brave man and a warrior” (v. 18). 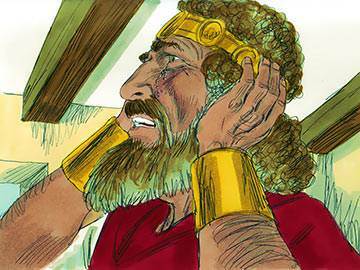 When Saul is possessed with an evil spirit, his servants suggest that he be brought to soothe the king with his music. The courtiers hope that his ministry in music will bring relief to Saul during his periods of depressions, and David’s playing has the desired effect. Saul is taken with David and grows to admire and love him. 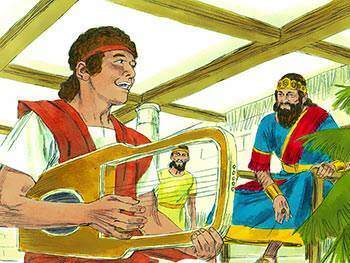 The musical ability which David shows opens a way for him into the king’s presence and the daily life of the court, which one day will become his own. Modern-day research shows that music is one of the greatest influences in human life. It can influence us for good, or influence us for bad. Learn to shut your ears to the raucous music of the world and concentrate instead on “making melody to the Lord with all your heart”. 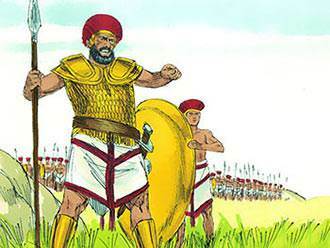 When the Philistines and the Israelites face each other across the valley of Elah for another round in their never-ending conflict, the Philistines produce a nine-foot champion named Goliath. He calls for an Israelite to step forward and face him in a one-to-one combat and thus settle the war. 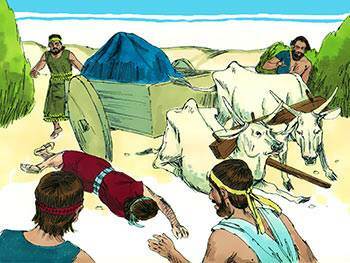 The Israelites, including Saul, cower in fear in the camp. 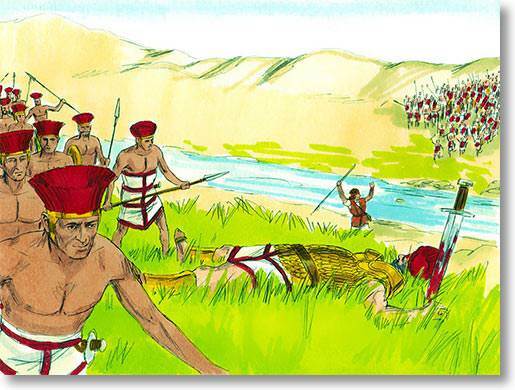 David arrives on the scene, and is outraged that Goliath’s challenge—eighty times repeated—should remain unanswered. 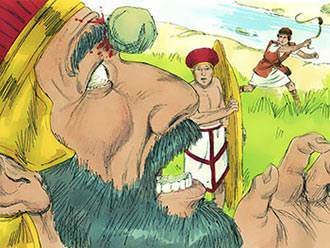 He responds to Goliath’s challenge in the name of the Lord and, refusing to wear Saul’s armour, fells the giant with one well-directed stone from his sling. 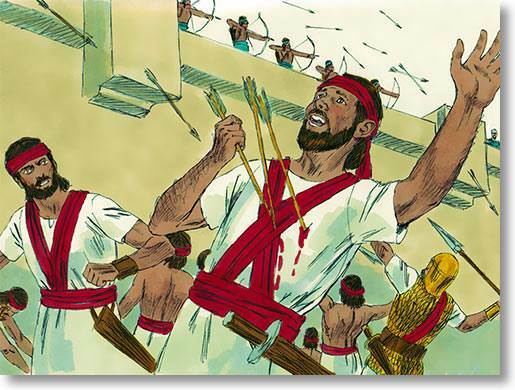 The craven army is thus inspired with fresh courage to enter into battle and eventually overthrow and defeat the Philistines. Do you have a ‘Goliath’ in your life at this moment? Someone—or something—that causes you to cower in terror and fear? Then rise up in the name of the Lord and hurl your faith at the problem. Remember, the God who lived in David’s time is just the same today. 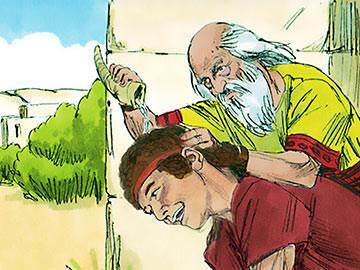 Although David was anointed to be king, he could not be enthroned as king until after Saul’s death. When eventually David ascends the throne of Israel he is about 30 years of age, and one of his first exploits is to capture Jerusalem from the Jebusites. 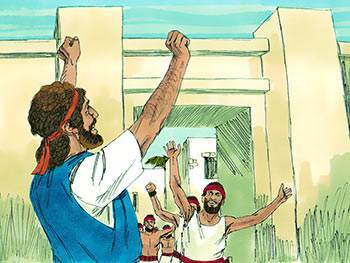 Having made Jerusalem his capital city, David decides that the Ark of the Covenant, which had remained in Kiriath-jearim as a half-forgotten religious relic for close on eighty years, should be brought to Jerusalem. He appears, however, to have been ignorant of the laws which governed the transportation of the Ark – namely that it should be borne on the shoulders of consecrated men—and loads it on to a new cart. When the oxen drawing the cart stumble and the Ark looks as if it might topple, Uzzah puts out his hand to steady it—with fatal results. Someone once said: “The Church is looking for new methods, new machinery, and new modes of operation, but God is looking for new men.” We ought not to forget that God has designed His Church to move forward, not on the ‘new carts’ of human achievement, but on the shoulders of men and women whose lives are devoted to Him. Worth pondering? David dispatches his army to fight the Ammonites, but he himself remains in safety in his palace. One afternoon while sitting on the flat roof of his home he sees, close by, a beautiful woman—Bathsheba, the wife of Uriah the Hittite—washing herself. Overcome with lust, he sends for the woman and seduces her. 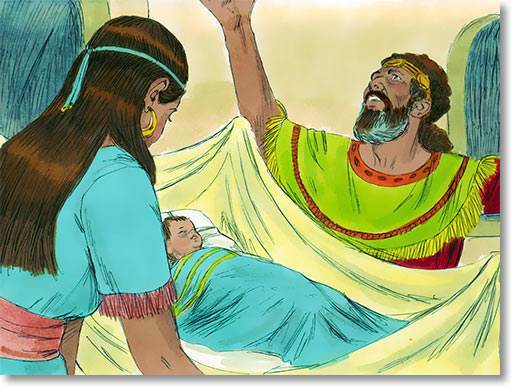 Later, when it is discovered that Bathsheba is expecting David’s child, he sets up a carefully contrived plan to make it appear that the baby really belongs to Bathsheba’s husband. David summons Uriah from the front and, after some polite conversation, suggests that he spends the night with his wife before returning to the war. Uriah refuses to do this, and thus David’s plan to avoid a public scandal is foiled. David sends Uriah back to the front with a letter instructing General Joab to arrange his death in battle. There can be little doubt that the greatest deception is self-deception. Take a moment right now to examine your conscience and ask yourself: am I walking about with a drugged conscience, calling evil harmless until I really believe it myself? David did, but what is more—so might we! David at last realises the enormity of his sin and confesses it to God. 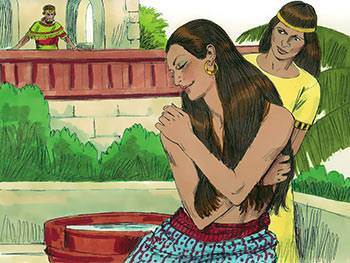 In spite of this, however, his family life is blighted and the death of his first child by Bathsheba is the beginning of many sorrows. Probably the only way God could save David from his self-deception was through Nathan’s pointed parable. It took a parable to bring him face to face with himself. Read it once more and then ask yourself: am I that man? Am I that woman? If so, then remember the forgiveness David found can be yours also. David contributed to the life of Israel, not only as its king, but as its foremost songwriter. 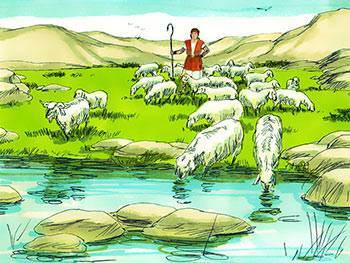 He is described as “the sweet psalmist of Israel” (23:1, RSV). The psalms which David wrote, as well as others composed by different authors, make up the ‘heart’ of the Bible. All human emotions are to be found in the Psalms—the welling fountain of feelings and imaginations, joys and griefs, cravings and aspirations, hope and despair, gloom and glory. More persistently than anywhere else in the Bible, the Psalms bring home to us the overwhelming sense of the reality and personality of God. The sight of His face is better to the Psalmist than an abundance of corn and wine, and His presence by the side of the perplexed spirit soothes it into peace again. Why not make a commitment to meditate on and memorise a psalm that is short, yet full of joy and thanksgiving? We suggest Psalm 100. Memorise it and meditate upon it throughout today. Then, if you can, repeat it to someone before the day ends. The Star of David is made up of two equilateral triangles forming a six-pointed star—a symbol which is used by Jews all over the world. There are many explanations of the symbolism of the Star of David. One is that in both Greek and Hebrew, the letter “D” is shaped as a triangle. Thus the star would represent two letter D’s—the first and last letters of David’s name. The Star of David has been found in the ruins of a synagogue at Capernaum dating from the third century. But it is much older than that. The Jews were forced to wear the Star of David in the Middle Ages, and again when they were persecuted in Germany by Hitler. To them it is a badge of honour, not of shame. One commentator says of David, “It is rarely that a nation has associated all her attributes within the life of a single man. The David of Israel is not just the greatest of her kings, but the greatest shepherd, the greatest musician, the greatest soldier, and the greatest poet.” Brave and chivalrous, energetic and prudent, a judge of men, a true lover of his country, just and wisely impartial—David had many excellent characteristics. His weaknesses, however, are undeniable—a fact the Bible does not attempt to disguise. The great sins of his life—his adultery with Bathsheba and the murder of Uriah—are portrayed in lurid detail, reminding us that even ‘a man after God’s own heart’ is capable of the most revolting sins. The main lesson of David’s life is this: no one can walk through life in moral uprightness without a close dependency on the Lord. 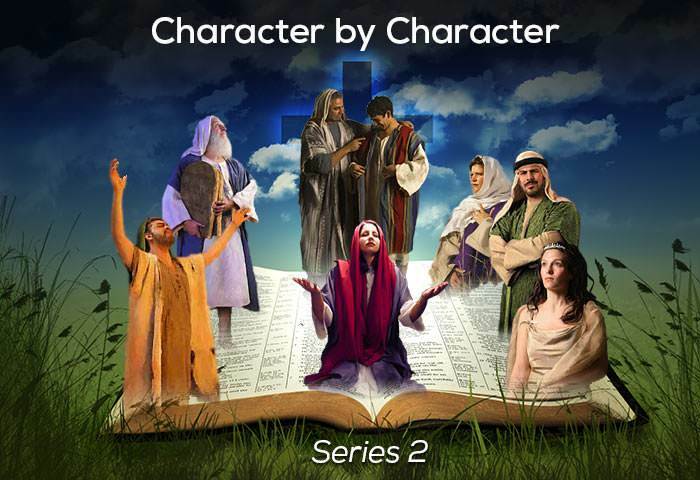 David, despite his many fine qualities was an utterly weak person without the help of God. That goes for you too. As someone put it, “The Christian life is not just your responsibility, but your response to His ability.” Keep close to the Lord, for without His constant presence and companionship you will not be able to make it.